Over the years, we have found that word-of-mouth marketing from our current WCA families is one of our most powerful forms of advertising. No one can convey the impact that WCA has had on our students’ spiritual and intellectual growth better than the parents who have seen these dividends paid on the investment they have made by sending their children here. Often, however, there are families who respond tremendously to our mission and vision and truly desire to enroll their children at WCA, but the costs are just out of reach for them to make that happen. WCA wants to give you, our faithful WCA families, a tool for you to use to help WCA become an even more incredible, diverse, and dynamic school by referring some of those students in targeted grades. For any student you refer to WCA in these selected grades in which we are seeking to increase enrollment, those students can enroll at 25% off annual net tuition rates. Sounds incredible, right? Well, that’s not all. WCA also wants to thank you for promoting WCA to your family and friends. For the balance of the 2018-2019 school year and into the 2019-2020 school year, as part of the student referral program mentioned above, for every student you refer to WCA you will ALSO receive 25% off your own student’s net tuition. The tuition deductions are awarded per student (not per family) and there is no limit to the number of students you can refer! So what’s the catch? There is one small catch. The deductions only stay in place year after year as long as BOTH the student at WCA and the referred student are still enrolled at WCA! We’ll address some of the terms and conditions and frequently asked questions below on this webpage. To get started, though, start talking to everyone you know whose kids you always thought should be at WCA, and once you have some interested families, fill in the New Student Referral Form below. You can also fill out paper copies in the front office. Note: This form, filled out either here or on our paper version, MUST be submitted prior to the referred family's tour or start of application. Referral forms will not be accepted after families have completed their tour or started their application. The safest way in which to submit the referral form is here online, as the submittal will be time-stamped. If you have more than one student, and more than one referral, please which of your students'tuition we should apply the referral credits to 1st, 2nd, 3rd, etc. Grab some of our new tour referral cards in the front office to hand out to prospective school families! The New Student Referral Plan is open to all parents or legal guardians with K-12 students enrolled at Williamsburg Christian Academy. The program does not apply to new incoming PreK students. Credits earned will be applied in October for students starting at the beginning of the school year. Credits for students starting after the beginning of the school year will be applied one month following the start date of the new family. To qualify, the new family must remain in good financial standing with the school for at least 30 days. Deductions will be based on the new tuition amount after all discounts and scholarships have been applied. Tuition credits are only available for referring new families to WCA, and excludes families that have been away less than 24 months. Referred students cannot have a sibling currently or previously enrolled (within 24 months) at WCA. The New Student Referral Plan is a separate offering from the Family Referral Discount and the two may not be combined. The New Student Referral Program is subject to review or suspension at any time. Interpretation of Program parameters will be at the discretion of the Williamsburg Christian Academy Board of Directors. The offering of the New Student Referral Plan is subject to class size or overall WCA enrollment and may be discontinued in part or entirely by the WCA Board of Directors. Q. How do I start the process of referring a family and their student? A. The first step in referring a family is to approach them, explain the new program, and invite them for a personalized tour so they can visit and determine if WCA is the right fit for their student. 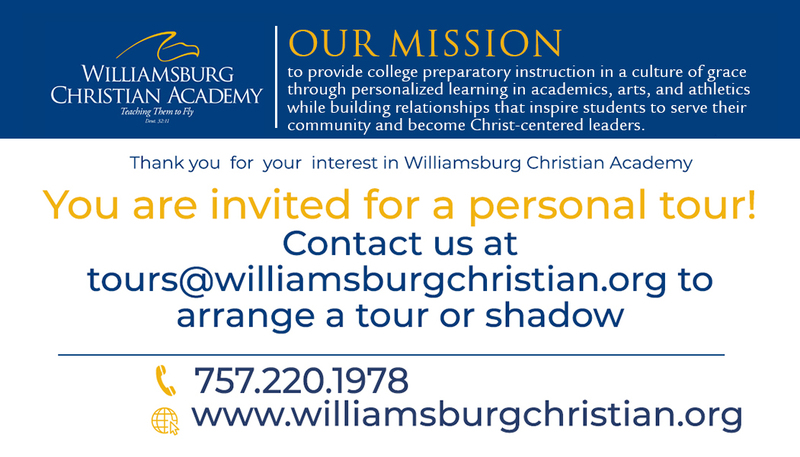 We have special business cards with the admissions contact info on it, or you can simply have them call us or email tours@williamsburgchristian.org, after you have submitted the New Student Referral Form. Q. How does WCA know that a family has been referred by me? A. In order to get credit for a referred student, you must pick up and fill in a New Student Referral Form from the Front Office, or you may fill one out online at the Student Referral Plan website at http://bit.ly/studentreferralplan. This form MUST be submitted PRIOR TO the family arranging their tour! Once the family is scheduled for a tour, we will attach your form to their application and once they’re fully enrolled, you will receive the credit (per the terms listed on this page). Q. 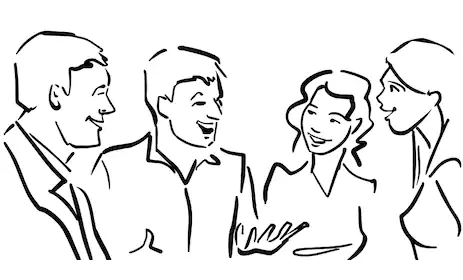 Is there any limit to how many students I can refer? A. No, you may refer as many students as you want, and will receive a credit equivalent to 25% of your net tuition for each one. Your credit benefit will obviously max out at the full amount of tuition you owe for your own students. Q. If a refer more students than I have tuition to be offset, can I transfer my credits to a future year or to another person? Q. Do I (and the family of the student I referred) just get the credit in the year I refer the new student? A: No, you and the family of the referred student will continue to get the discount year after year until your student or theirs graduates or your student or the student you referred leaves WCA. Q. Do I qualify for these credits if I already have discounted tuition or receive scholarship funds? A. Yes, you may earn credits against your remaining tuition amount after discounts or scholarships have been applied. Q. If I receive a scholarship/discount that reduces my tuition, do I get the credit off the full tuition amount, or what I pay currently? A. Your credit is calculated from your net tuition amount, the amount that remains after all discounts and scholarships have been deducted. Q. If I have no more tuition to be offset, can I apply my credits to my fees? A. No, credits can only be applied to tuition owed. Q. If the family whose student I refer also knows families they think would be a great fit for WCA, can they earn additional tuition credits referring new students themselves? A. Yes, once the family has fully enrolled their student, they are eligible to earn additional tuition credits themselves by referring students into the targeted grades. Q. If I only have a Pre-K child at WCA, and I refer a student in the targeted grades, will I receive a tuition credit? A. No. There are no credits available for current students in our Preschool program. However, if you refer a student in the targeted grades and subsequently enroll your student into our kindergarten program, for that year and every year after, if the referred student is still attending WCA, you will receive the 25% credit. Q. If I refer an 11th-grade student after they graduate, do I still get the credit? A. No, the referred student must still be enrolled at the school for the credit to remain in place. Another student would need to be referred in the targeted grades at that point to re-establish the credit. Q. I have multiple students at WCA. Do I decide which student my credit applies to? A. For your first referral, you may decide which of your students' tuitions the credit will apply to. For every additional referral thereafter, they must be applied to different student's tuition, until you have more referrals than students at the school, at which time the credit assignment process starts again.